Founded in 1973, the University of Aveiro, also known as UA, is a recognized national and internationally institution for its important technology center that invests in innovative areas. The quality of research especially in the area of engineering, puts it as one of the most prestigious universities in Europe. The campus has a central lane with gardens and water lines, served by a pedestrian gallery side, separating the buildings perpendicularly to this axis. The road circulation takes place via a perimeter that serves all buildings. The campus establishes an harmonious dialogue with the surrounding natural environment. This formal coherence was maintained throughout the two decades since the history of the campus. 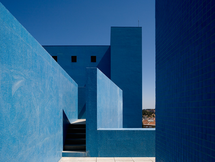 The University Library was design by the portuguese architect Álvaro Siza Vieira. Siza says that the conceptual idea is based on the geometry of the saline. "In there, is the origin of the architecture of the Library, of its deployment, horizontal openings, volume and the light that invades the interior." 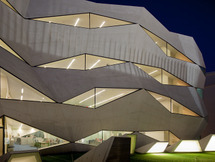 The library plays a central role in the organisation of the university campus situated on the edge of the city of Aveiro. A free-standing curving wall characterises the western façade and expresses the reinforced concrete structure of the building. This baffle admits reflected light while a continuous horizontal cut at the third level assures (for those seated) a visual connection across the sait marshes extending to the horizon. All electrical and air-conditioning services are integrated into the perimeter shelving system at each floor allowing the ceilings to be left uncluttered and spatially continuous with the vertical voids which traverse the interior spaces. This configuration also permits the spatial continuity of the double curvature of the ceiling at the top floor.